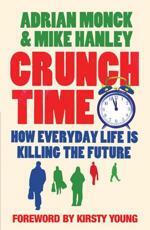 It was the title of this book that caught my eye, ‘Crunch Time: How everyday life is killing the future’. It is, in their own words, “an investigation of our period of history, the age upon which our ideas and actions will stamp their mark.” We live at a decisive moment, at Crunch Time. Plenty of people have believed they lived at a turning point in history, but Monck and Hanley give a number of reasons why our current lifestyle is particularly dangerous. “The world is now a faster, riskier, more contagious place, the ‘unintended consequences’ of capitalism become apparent violently, critically and quickly.” Written in 2004, it would appear that this is another book that foresaw all the right conditions for the economic slump. Having introduced the idea of Crunch Time, the authors explore a series of inter-linked crises that threaten civilization as we’re currently playing it. They address the excesses of consumerism, the inequalities of globalization, immigration, and dangerous science. The two writers bounce ideas back and forth, disagree with each other, and it feels like something thrashed out between friends, one in London and one in Sydney. At times it’s funny and irreverent, elsewhere insightful. There are ideas and coping strategies at the end of each chapter, although they often fail to come anywhere near solutions. It’s also a little patchy, which is perhaps unsurprising given the scope of the book. The chapter on the environment is a weaker one, resorting to caricatures of environmentalists as tree-huggers and bath-dodgers. It’s played for laughs, but it’s silly. I also disagree with their assertion that “global warming has no moral content”. Climate change is caused by the rich, but the poor are affected first – it’s a huge justice issue. There is a truth to Monck and Hanley’s line that “global warming doesn’t sicken, anger or shame us”, but it should. Perhaps if we stopped fixating on polar bears we’d communicate the justice angle better. Like many of these sorts of books, the book is bigger on the problems than the solutions, and it doesn’t offer a whole lot of hope. There’s just a repeat of their idea what we do next will be really important, and we all have a part to play in it – “we’re all micro-players in this macro-decision moment”. Quite what we’re supposed to decide isn’t nearly so clear. I see there’s a different edition with the subtitle ‘Crunch Time: how to live a more ethical and meaningful life without giving up your worldly goods, joining a commune or losing your sense of humour’. That gives you a better sense of the tone of the book, if not the content. And if my edition had that title, I wouldn’t have read it – I don’t think you can live an ethical life and keep all your worldly goods. Our lifestyles are unsustainable, and reducing our consumption is unavoidable, one way or another. It’s a fun read, but despite its good intentions, in the end Crunch Time ducks its own challenge. Indeed, quite fair. Although I have now changed my position since writing the book. We’re fucked, and there is little we can do about it. You know I have to agree with you about the global warming being a justice issue. I have a strong feeling that lots of people are going to suffer and die in the next century as our world changes from the damage we’ve caused. I believe we can do a lot to slow and lessen that pain, but it will be hard. Ultimately, the people that are likely to suffer the most are the poor and developing nations that really didn’t get us in this mess. Having reread this review with a little more time and thought, I think you hit the nail right on the head, Jeremy. The conundrum for us all the way through was, well, OK, there are all these big global problems, and we as individuals MUST bear some of the responsibility for solving them…but each individually, and certainly together, are overwhelming for society as a whole, let alone for the individual that we came to the end of each chapter and the whole so what thing became a bit overwhelming. The same with the thesis for the whole book. Yes its Crunch Time, yes, if we don’t do anything we’re all going to hell in a handbasket…now, what to do? Turn off the lights. Tick. Walk instead of drive. Tick. Be cautious about scientific developments. OK…now what…Help! I think that’s the point when you have to start looking outside of individual actions. There’s only so many ‘top tips’ you can do, and they get you anywhere near one-planet living, because the whole system is stacked against you. At this point the government needs to step in, legislating for more efficient cars, switching subsidies from agribusiness to local organics, cap and trade, funding renewable energy. They have to put in place the systemic changes that we can’t do as individuals. However, since the government is moving far to slow, and hasn’t even noticed things like peak oil yet, my money is on community initiatives. The Transition Towns movement, for example, sits neatly between individual and government action. It brings people together at just the right level to get started on something big enough to make a difference, but not so big that its beyond our control.